Drawing motion in an action scene is exciting, but it does take some time. However, the result is worth the effort! Take a look below to see how a simple basketball shot becomes an amazing action scene. 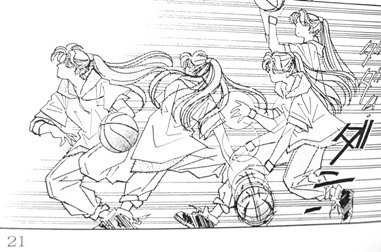 Here, the same character is drawn four times and overlapped to show her dribbling a basketball. The action moves from right to left since this is the Japanese version of the comic -- she is about to shoot, then to avoid a block goes low to dribble the ball, spins and moves forward for a better shot. Her hair swirls with her motion, there are action lines behind her movement to make this even more 'actiony', and the outline of the basketball is drawn with sketchy lines to shown motion -- and also overlapped in places. Important Point! When drawing action lines, leave a blank space where the character is about to go. The reader will imagine the character's next move in that blank space without you having to draw it!